to encourage and open the stage for the new generation designers to have an opportunity to exhibit their work to the public and encourage them to have the creativity in the jewelry design. to encourage the use of designed pattern to be made as a real products in the gem and jewelry industry and this might be a chance for the newcomer to be a professional. to develop the human resource in the Thai gem and jewelry industry to be able to sustainably compete in the global market. Our institute had promoted the first contest in 2007 under the topic "Rhythm & Colours - The Miracle of Jewelry" which was originated from the idea of the creation of inspiration from the music. This competition focuses on creating abstract and innovative designs to convey the miracle of rhythm and colour deriving from jewelry’s precious beauty. Colours…lines...rhythm…styles…can create a miracle. It is also a perfect combination of two fields of art, musical art and fine art. It can be said that the 2007 design contest was greatly successful. There was widely acceptance from the professional designer or even students. The institute provides all designers with an opportunity to release their creativity power and show their abilities to entrepreneurs and general people who are interested. This competition can pave the way for being professional jewelry designers, so it is a good opportunity for designers to formally show their craftsmanship. In addition, they can make themselves known widely to the public. Nowadays, the gem and jewelry industry’s demand for designers has been very high. In the upcoming competition, GIT expects that there will be newcomer designers with distinctive skills entering the Thai gem and jewelry industry. This competition will encourage jewelry designers to imagine, be creative, and be determined to continuously develop themselves. This will lead to the creation of products which are accepted and successful in the gem and jewelry industry. 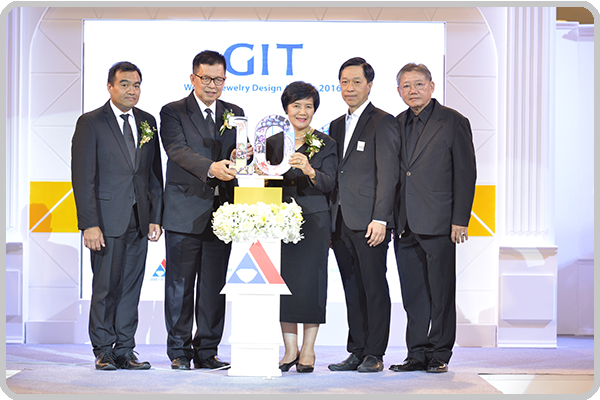 GIT is confident that every newcomer designer will be a main driving force enabling the Thai gem and jewelry industry to compete in the world market successfully.